Over the past eight years I was given the opportunity to collaborate with Tufts School of Medicine researching the philosophy of Tai Chi and its effects on both arthritis of the knee and Fibromyalgia. I was asked by one of the researchers at Tufts School of Medicine to design and implement an intervention for both debilitating diseases. This article will give a basic overview of what I witnessed during the 12-week study, “Tai Chi Intervention for Fibromyalgia" at the Tufts School of Medicine. In this short article I will focus on the benefits, which were produced from these specific principles and techniques using Tai Chi philosophy. Fibromyalgia is a Rheumatic condition. Fibromyalgia is a disorder causing aching muscles, sleep disorders, and fatigue associated with raised levels of the brain chemicals that transmit nerve signals to the body. Fibromyalgia can lead to depression and to social isolation. The constant chronic pain affects people physically, mentally and socially. The disorder affects an estimated 10 million Americans, but it occurs most often in women. Many of the individuals who suffer from Fibromyalgia experience debilitating pain, which immobilizes their daily physical abilities. When you lose physical independence, it often leads to depression. When people are depressed, they will often overeat and gain weight quickly. The stress resulting from the pain, depression, and isolation of Fibromyalgia will often cause the patient’s health to spiral downward. Not everybody is obese or overweight, but from my personal experience about 70 percent of the patients were overweight or obese. In the United States, if you are 30 pounds over your recommended weight you are obese. The first benefit I witnessed was patients, one by one, coming out of their depression. Within three to four weeks into the 12-week study, I saw changes happening. Women start dressing up, using cosmetics, and getting their hair styled. I understand from these patients that they started going out more, taking part in more social events. Over time and practice of the mind-body program, many patients actually started inspiring other people such as family and friends. This new mood is due to their achieving physical independence as well as being in a positive support group with emphasis on physical and mental ability for two one-hour sessions for 12 weeks. I half joke some times that we are a mind-body support group for Fibromyalgia, which is a little different from your typical support group which most of the time only talks. I am a strong believer in a “doing” support group with emphasis on physical activities and meditation, which I believe works better than only talk. I do think that a combination will actually give more individuals the best of both worlds. The second benefit that I witnessed is strength, in both the lower and upper body. Strength is important for many reasons including daily tasks, supporting and nourishing the bones, and also as a mental booster. There are many practical examples for this strength theory. When you have strong legs and you know it, your self esteem and confidence is stronger. When your upper body is strong and you know it, you may need to change a shirt size, and when you look in the mirror you will see more defined shoulders. You will feel good about yourself. Your confidence and attitude will change to a more positive one. Strength built up over the 12-week program allows individuals to start doing daily physical performance that we, healthy people, take for granted. Prime examples are: climbing stairs, carrying groceries, or holding your children or grandchildren. It’s important to know that most patients could perform some exercises at the beginning of the study. Some could do 10 up and down from a seating position on a chair or maybe 30 seconds standing in a horse stance against the wall. But at the end of 12 weeks, 90 percent of the patients could do 30 up and down two sets, legs together and legs apart, and three to five minutes stationery horse stance against a wall. This is a huge improvement and a symbol of very strong legs and a positive attitude. Many people invest most of their time doing the Yang side of exercise such as resistant or cardiovascular work outs. But the program I designed mainly focuses on flexibility, deep breathing and meditation while evoking spirituality, which is more of the Yin side of exercise. In the program, patients spend a lot of time in various postures to achieve better flexibility to free the skeleton from being a prisoner of the soft tissue. My goal was to move each individual at least two to three numbers down my scale of flexibility through the nine body markers, the ankles, quads, hamstrings, groin, outer hips, hips, lower back, shoulder girdle and neck. To my surprise most patients moved three and more numbers down my flexibility scale. The improved flexibility allowed individuals to enjoy life even more because they were able to balance the new strength with flexibility. Patients were much better than they were before. They were in a new place, which I call “having power.” You can be strong and stiff or you can be flexible and weak, but if you find the balance between the two you will be powerful. 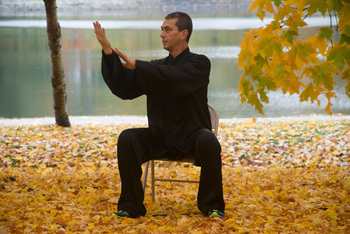 Our mind-body program was and still is unique in that the Chi kung/Tai Chi movements are trained to both the left and right. Also, patients were able to do any of the exercises in a sitting position. These two facts alone allowed many individuals to stay with the class and not drop out. The idea that everybody can do something created an atmosphere of empowerment among all the patients. It amazes me how far patients will go if you just give them a small task to make them part of the solution for their own disease. The intervention definitely empowered them. I have witnessed the positive chain reaction of this principle reaching great places, which I am almost sure would have been hard to achieve just through passive care. Individuals started to take control and lose weight. They were happy, looking for old hobbies, which the depression stopped them from doing or picking up new ones just to try new things. Some told me that the program helped them to cut back on medication because now they experience less pain and better physical performance. This new state of being allowed them to go play golf again or play the guitar, or for some even the small act of being able to tie their own shoes. I did not anticipate the results from this mind-body approach. I was thinking on a small scale, but I did not realize that what I considered small is huge for my patients/students. What I did not take into an account is the positive chain reaction and the power of empowering the patients/students. A few years later, I still see at least five patients from the various groups of research, most of them, at this point, are my students. They are better than ever and most in some way will admit that they are addicted to this mind-body world. And they don’t do it every day, they will fall apart. I tell them that I am exactly the same. The Chi kung/ Mind Body/ Tai Chi program is a journey in which you strike a balance between external and internal work, developing the body and mind, while tapping into sources of abundant universal energy, such as the earth and sun. In doing so, you will be on the right path to developing a powerful fighting spirit, and a better quality of life for you and those around you. The New England Journal of Medicine published results of my 12-week study, A Randomized Trial of Tai Chi for Fibromyalgia, at Tufts School of Medicine concluding that regular Tai Chi practice can help patients with Fibromyalgia. And the New York Times published Tai Chi Reported to Ease Fibromyalgia based on the study. The DVD, Sunset Tai Chi, focuses on the short form in the Fibromyalgia study. Other articles may be found here.